The lows in Colorado have been between 45-55F! 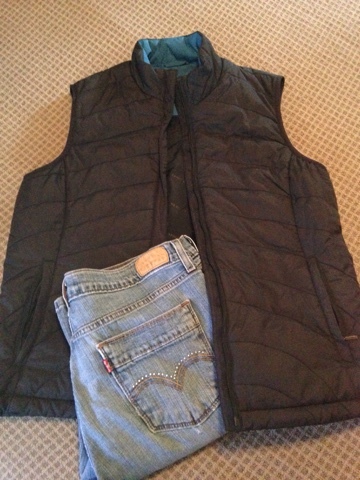 I left a box of winter clothes in storage, but apparently by favorite jeans and ALL my vests are on the boat! Clever. My layering is severely lacking. Hoping to avoid buying new clothes, (and hoping to change out of my jammies before 10:00 am), I took the advice of several locals and hit the thrift shop. I got lucky and scored a pair of Levis in my size ($6.99, vintage and very soft), and a Lands End vest ($4.99 and like new). I had a grey fleece Campmor vest in my hand until I stumbled onto the above vest, misracked in the men's section so be sure to swing through there also. Not only did I save some dough, I'm recycling! I'm still looking for a long-sleeved t-shirt to round out the ensemble.